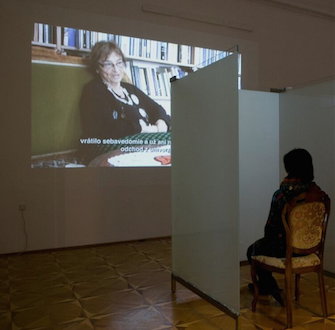 From 1st December 2017 on, the interactive video installation "Zsofia Meller" by the Hungarian artist Ilona Németh will be shown at the Institute of Human Sciences. The primary theme of this work is a personal interview with the philosopher Ágnes Heller. The original intent of the artist is to focus on the roles of exceptional women through their family stories. The Zsófia Meller movie brings the story about what influence the model of a strong woman in the family - the grandmother, had on the life journey of a world renowned female intellectual. One particular "picture" in her storytelling especially aroused the interest of Ilona Németh: namely that the first woman studying at the University of Vienna, Zsófia Meller, could only participate in the lectures separated from the male audience by a folding screen. This "picture" from her private memory should have consequently become the key component of the installation. national descent. Over the past 25 years Németh has created a vast body of work, constantly questioning ingrained identity patterns and truths offered up by the majority opinion. She has openly engaged with her multi-national affiliation and critical political mindset, including her family background of active politicians, sociologists and lawyers. Her immediate surroundings – its objects, characters and occurrences – serve as her starting point for video and photographic articulations.